Adapted to screen by the original play’s creators (Jeremy Dyson, of The League of Gentlemen fame, and Andy Nyman), Ghost Stories is a wry psychological horror that explores whether the paranormal tales within are real, fictitious, or some darker thing in between. Professor Phillip Goodman (Nyman reprising his role from the play’s 2010 theatrical debut) is a paranormal debunker tasked with revisiting three unsolved cases. 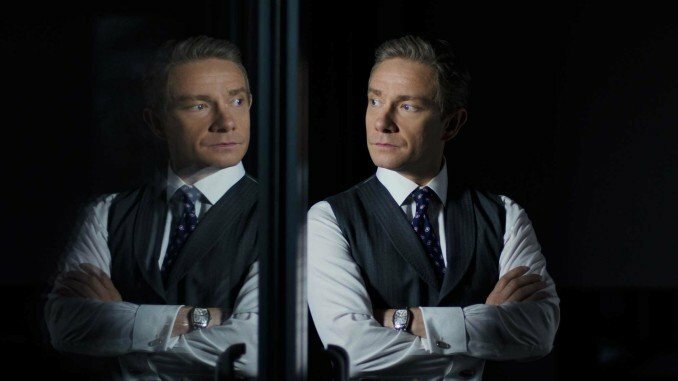 He sets out around gloomy northern England to record the reluctant claims of a night watchman (Paul Whitehouse) tormented on the job, a young lad (Alex Lawther) terrorised on his way home through the woods, and a banker (Martin Freeman) embittered by the ill-fated birth of his only child. Goodman treats each with haughty scepticism whilst finding it increasingly hard to ignore his own demons, who happen to be stalking him throughout. Reminiscent of Shaun of the Dead, Ghost Stories weaves the banality of real life (one character’s phone loses signal not because he’s in the middle of nowhere, but because he’s with O2) and fantasy to create a horror film that doesn’t take itself too seriously. The scares are often dished out via old, overused tropes (Ah! An object moved but then nothing happened subsequently! ), but the film packs in enough genuinely gruesome and disturbing moments to leave even jaded viewers squirming. Visually, it’s similar to This is England ‘90 (another Warp Films production), teasing a dark beauty out of the Brexit Belt with its bleak warehouses, rusting caravans and windswept fields. Lowther evokes his brilliant performance in Black Mirror’s ‘Shut Up and Dance’ as a spineless, fear-crazed youth, and Freeman’s turn as the unsavoury career man is a refreshing change from his best-known bumbling roles. The almost entirely male cast is a little disappointing – as was the almost entirely male room of reviewers – but can be forgiven because this isn’t just an unimaginative circle-jerk movie where manly men do manly things. Ghost Stories is about 21st century people scarred and alienated by experiences that they just know can’t really have happened. I initially found myself, much like the professor, wondering what all the fuss was about (if a phantom does little else but turn off the lights and scream at you, maybe it doesn’t want to hurt you – maybe it’s got a migraine). But, as the minutes tick past the plot congeals into something decidedly more sinister. Ghost Stories is an entertaining and often-scary rethink of a classic horror theme, which begs the question: which we should fear more – the paranormal or our own minds? Ghost Stories creeps into cinemas on the 6th April. Great review. Made me want to see it. Job done.